Department of State, Action Memorandum, Secret /Nodis/ Eyes Only, The Mankiewicz Trip, January 20, 1975. Frank Mankiewicz, the renowned political and media strategist and former president of National Public Radio, served as a "special channel" of communication between Secretary of State Henry Kissinger and Cuban commandante Fidel Castro in the mid 1970s, according to formerly classified documents posted today by the National Security Archive. When Mankiewicz died at age 90 on October 28, 2014, his obituaries highlighted his historic roles as Robert F. Kennedy's press secretary and George McGovern's presidential campaign strategist. But his missions as Kissinger's designated emissary to arrange talks with Castro in a top secret effort to normalize U.S.-Cuban relations received scant attention. A phone call from Mankiewicz to Kissinger in April 1974 to brief the secretary of state on a forthcoming trip to Havana to interview Fidel Castro set in motion Washington's first serious back-channel diplomacy to restore normal relations with Cuba. Kissinger used the opportunity of Mankiewicz's trip in June to send a handwritten letter to the Cuban leader suggesting secret talks; when Mankiewicz returned, he carried a positive note from Castro to Kissinger, along with a box of Cohiba cigars from the Cuban leader to the Secretary of State. In September 1974, and again in late January 1975, Mankiewicz carried additional messages from Kissinger to Castro; he also shuttled back and forth to Cuba's UN mission in New York to secretly arrange the first in a series of furtive meetings between Kissinger's deputies and Fidel Castro's representatives – a meeting which took place at La Guardia Airport on January 11, 1975. "Frank Mankiewicz and I met today at La Guardia airport with Mr. Nestor Garcia, First Secretary of the Cuban Mission to the United Nations and Mankiewicz's basic contact, and [Cuban diplomat] Mr. Ramon Sanchez Parodi, who had been sent from Havana to New York for this meeting," Kissinger's deputy Lawrence Eagleburger reported in a "secret sensitive" memorandum of conversation on these first, exploratory talks. "After Mankiewicz made the necessary introductions, the four of us had coffee together." "Frank was the ideal messenger for Kissinger," according to his friend and colleague, Kirby Jones, who accompanied Mankiewicz to Cuba and also served as a secret intermediary between 1974 and 1976. He had a "political and activist history that engendered confidence on the part of the Cubans" – credentials that also provided a degree of "plausible denial" for a Republican administration in case the mission leaked to the press. As the secret diplomacy advanced, according to Jones, Mankiewicz's "trustworthiness increased and he proved to both sides that he could indeed be relied upon to do what both sides needed and asked for." In January 1975, as Mankiewicz prepared to carry another Kissinger message to Castro, Assistant Secretary of State for Latin America William D. Rogers, recommended that the administration draw on "his credentials as a Democrat and a liberal" to introduce the issue of human rights into the talks with the Cubans. Rogers believed that the Castro government was more likely to be responsive to a personal suggestion by Mankiewicz than a negotiating demand by the Ford Administration linking the issue of family visits from Miami Cuban-Americans to easing the trade embargo. The secret Kissinger-Castro talks, and Mankiewcz's efforts to facilitate them, are detailed in a new book Back Channel to Cuba: The Hidden History of Negotiations Between Washington and Havana by Archive senior analyst, Peter Kornbluh, and American University Professor William M. LeoGrande. According to the book, Mankiewicz helped set in motion "the most serious effort to normalize relations between the United States and Cuba since Washington broke ties with Havana in January 1961." In this telephone conversation, Mankiewicz tells Kissinger that the "trip that I told you about is now on." When Kissinger understands that Mankiewicz is going to Cuba for a rare interview with Fidel Castro, he tells him: "Then I want to see you … I must see you before you do that." Six weeks later, when Mankiewicz travels to Havana, he carries a handwritten note from Kissinger to Castro. In this memo to Kissinger, his top aide, Lawrence Eagleburger, provides a summary of the meeting at La Guardia Airport with the Cuban representatives, Nestor Garcia and Ramon Sanchez-Parodi. After Mankiewicz made the introductions, the four got coffee and expressed personal comments about normalizing relations. At the end of the memo, Eagleburger suggests that since Mankiewicz will soon be traveling again to Havana, "you will want to consider with [Assistant Secretary of State] Bill Rogers what additional message Frank might carry with him." Eagleburger advises that "Mankiewicz will be departing for Cuba (via Jamaica) on Thursday, January 21" and asks if Kissinger wants him to carry a message to Castro. Eagleburger reports that Mankiewicz has suggested a list of "oral or written" statements that could be included in a message, reflecting his active participation in framing secret communications with the Cuban leader. Eagleburger concludes by recommending that "we should move the Cuban business out of the Mankiewicz channel" and into a Rogers and Eagleburger channel. 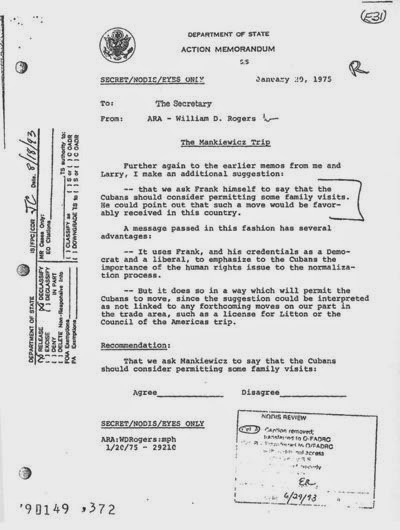 Assistant Secretary of State Rogers suggests to Kissinger that they use Mankiewicz to push the Cubans on allowing members of the Cuban-American community in Miami to begin family travel to Cuba, as if it was Mankiewicz's personal idea. Given Cuba's sensitivity to U.S. demands on human rights, Rogers suggests that Mankiewicz's credentials as a Democrat and a liberal will help to emphasize to "the Cubans the importance of the human rights issue to the normalization process." In his talks with Castro, Rogers notes, Mankiewicz "could point out that such a move would be favorably received in this country."